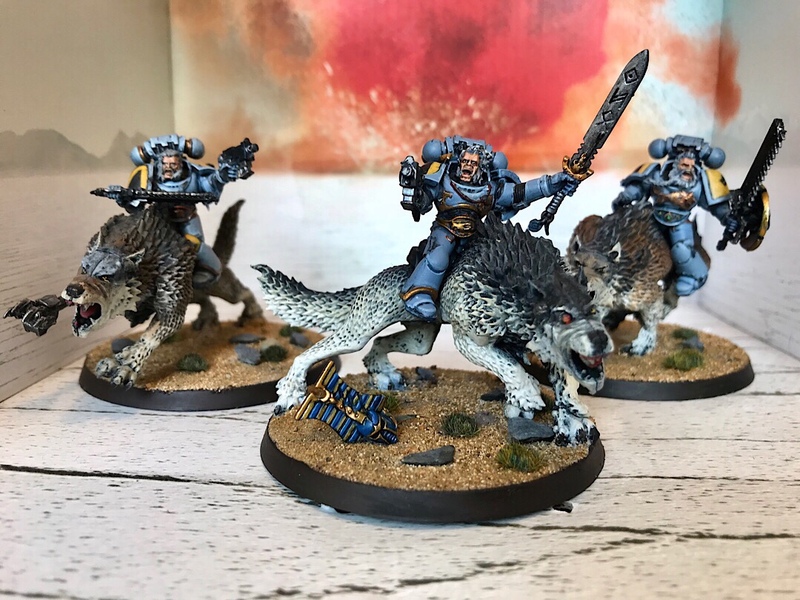 This is the space wolf army I’m currently Gaming with. You may notice some plastic RTB101 grey hunters with a few updates. There is also a 2nd edition wolfguard and grey hunters and 3rd edition scouts. I prefer the 3rd edition scouts to the 4th edition metal models and 5th edition plastic upgrades. This is the original Ulrik the Slayer model. There are only 2 minor differences to the current model. 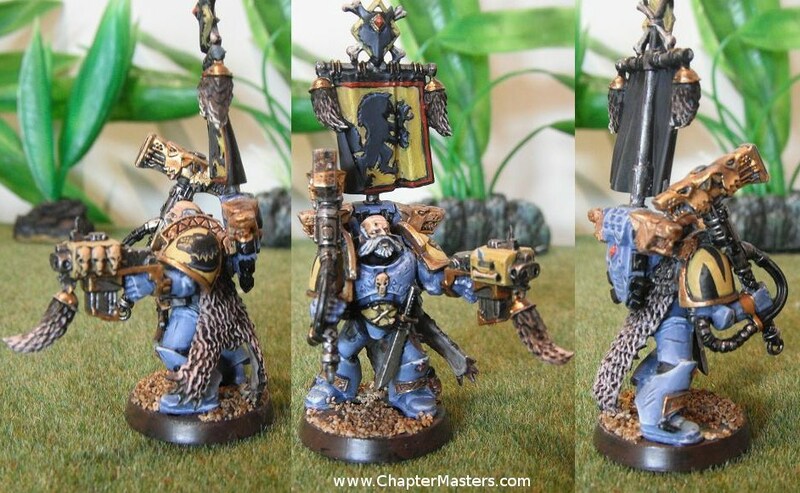 The first being that older space wolves backpack design with a banner pole is used (There will be a banner there one day), the second is that it’s made of metal. From memory there should be some detail his left shoulder pad, but I don’t appear to have the reference material anywhere. For the most part I have copied the current studio paint scheme for this model although some how it looks quite different. I’m not sure if it’s a defect in the casting or an optical trick but the helmet on this one looks wider than the studio model. 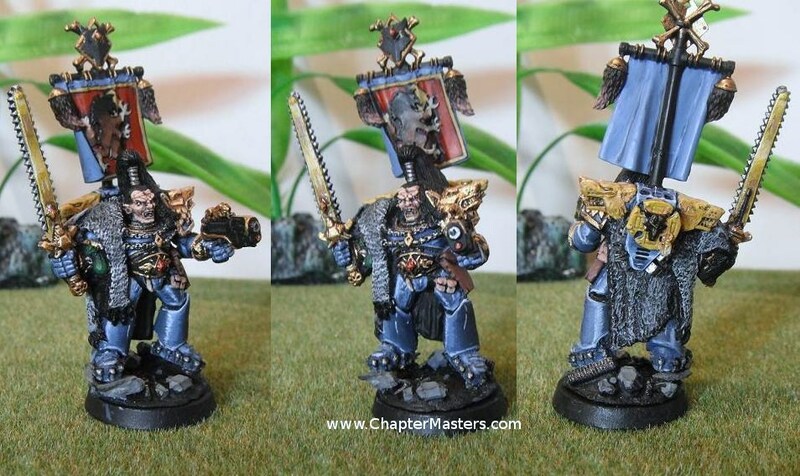 Njal Stormcaller in Terminator armour. This is the metal version of the model. Other than basing resin and sand it’s hasn’t been changed from the original design. This was painted in 2012 using a blended non metallic metal technique. Somewhat in a rush for a game I didn’t quite get it finished. I intend revisit it one day to finish the base, staff and furs. 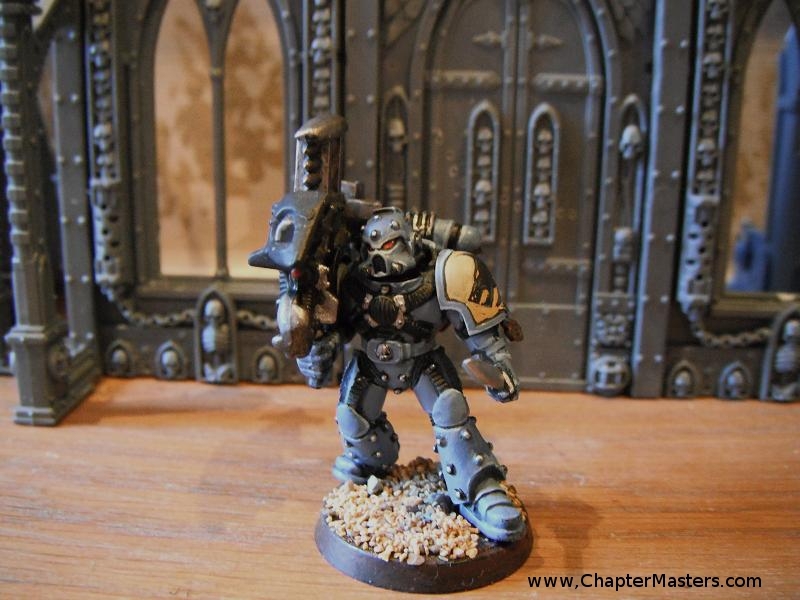 Rune Priest in Terminator armour armed with Storm bolter and force axe. 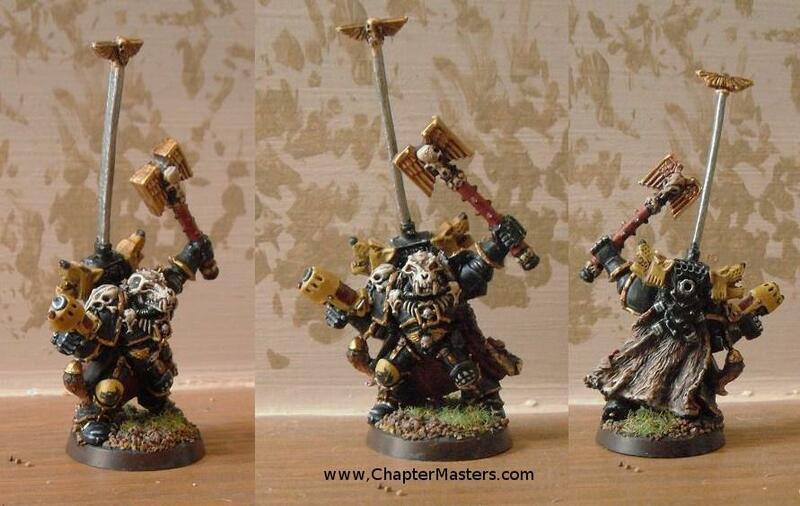 Wolf Gaurd Battle Leader in Runic armour armed with Storm bolter and Thunder hammer. Wolf Guard Battle in Runic armour armed with Lightning claws. 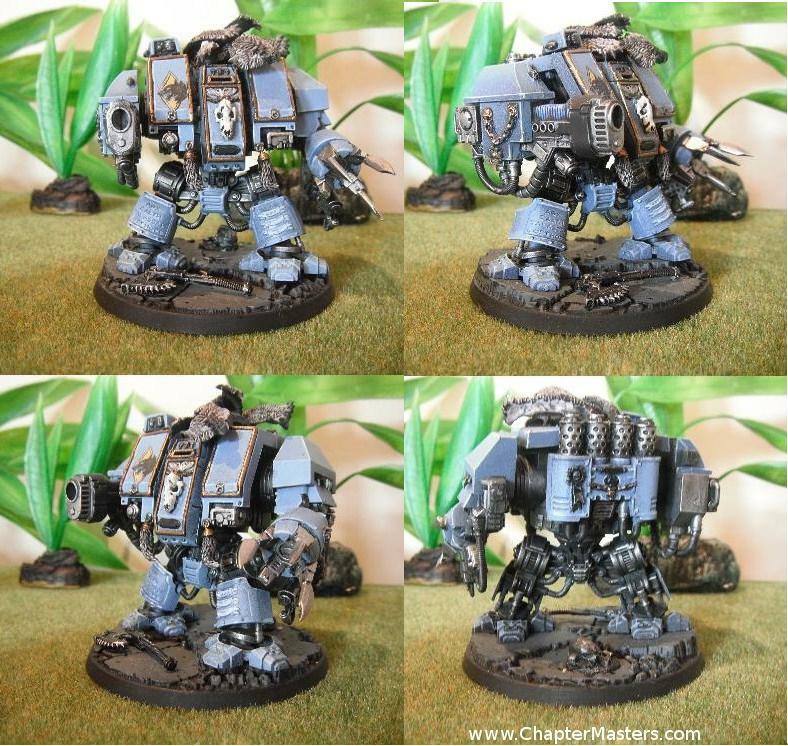 Can be used as part of a wolf guard body guard or to lead a Space Wolves pack. I’ve been working on these Models for a number of years. The Wolves I painted many years ago. I tried to copy actual wolf fur coats rather than copy GW’s studio models. The riders I’ve been plodding through ever since. I accidentally painted one of the riders armour in a different shades of grey due to do painting in low light levels. I’m still not happy with the riders faces, but view them as gameable. 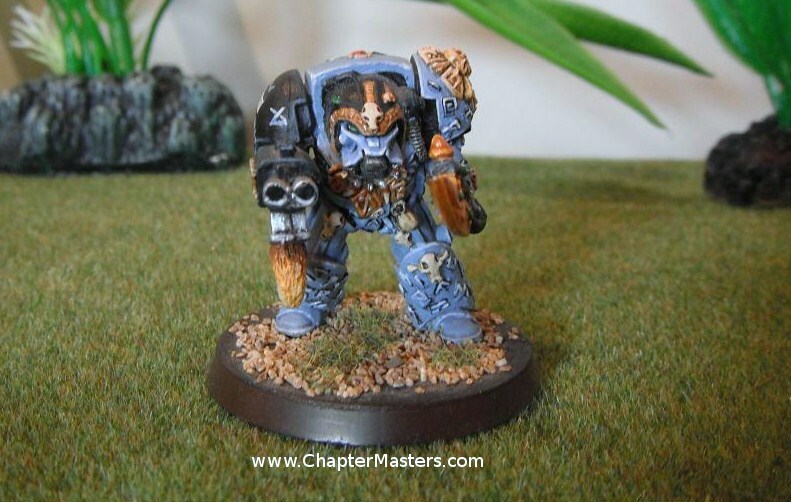 2010 Wolf Guard in Terminator Armour and 1995 Wolf Guard in Terminator Armour. 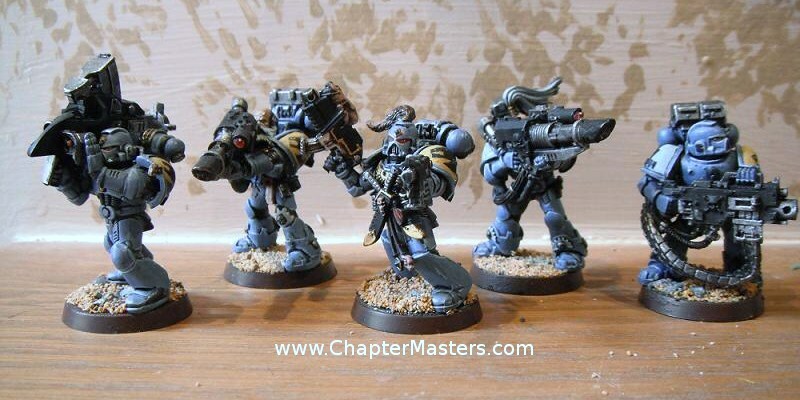 The model with the assault canon has the legs and Power Fist arm from the White Dwarf Black reach Terminator. 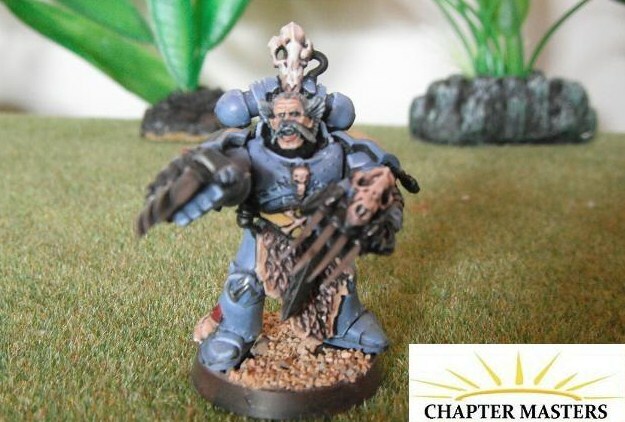 The Model with a Cyclone and the model with a wolf skin on his back are older metal Terminators. 1998 Space Wolf Scouts and 1993 Space Wolf Scout Sargent. Painted between 1993 & 2011. If equipped with melta bombs and deployed by going behind enemy lines these scouts can make an huge difference in games of Apocalypse. 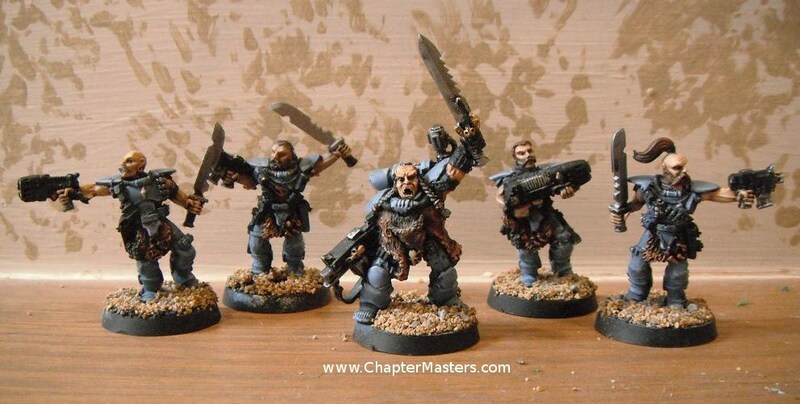 2009 Plastic Space Wolf Blood Claws. 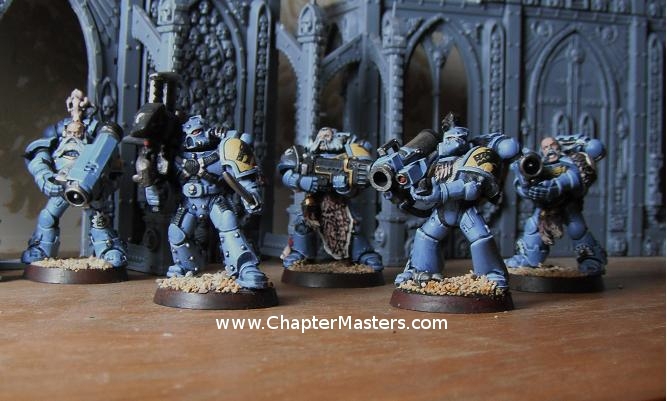 Painted: 2011 Legs and Torsos from Tactical Marines have been used to crate this squad. Doing this bring more variety to the army. 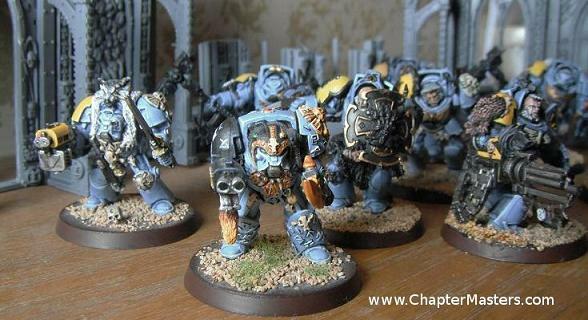 As Blood Claws are new recruits it stands to reason they will not have as many battle trophies as more experienced Space Wolves. 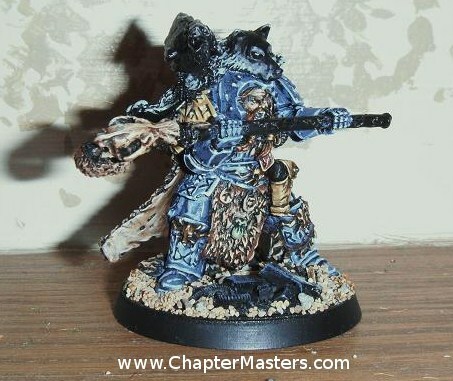 2009 Plastic Space Wolf Gray Hunters and Wolf Guard (Painted: 2011). This Pack Leader is armed with a Power fist. Components from the tactical marine box set have also been used in this squad. The current plastic Rhino kit with an added icon from the drop pod kit. 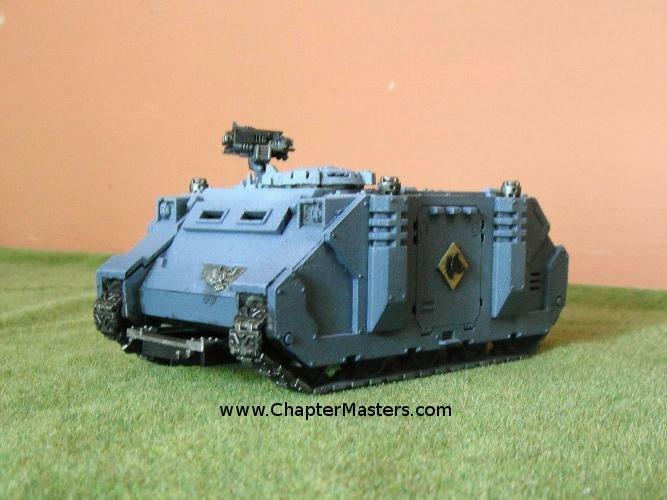 This tank has been painted with a spray gun using a Shadow Grey and Space Wolf Grey mix. Other than the icon and metal no highlighting has been used. These long fangs have been made from a number of different kits. Most of the heads and chest armour are from the current Space Wolves plastic box set. Some of the legs are from old metal devastator marines, one is from the Forge world Mk 5 marines. The Mk 5 armour model also uses a chest plate and arms from the tactical box set and head from Forge World. There are a number of different pattens of Missile launchers in these squads some come from tactical box sets, one is from Forge world, one is a hunter killer missile from the tank sprue, whilst one is from the original RTB01 box set.